History and description -: The site is located on dry bed of Vedic river Sarasvati. 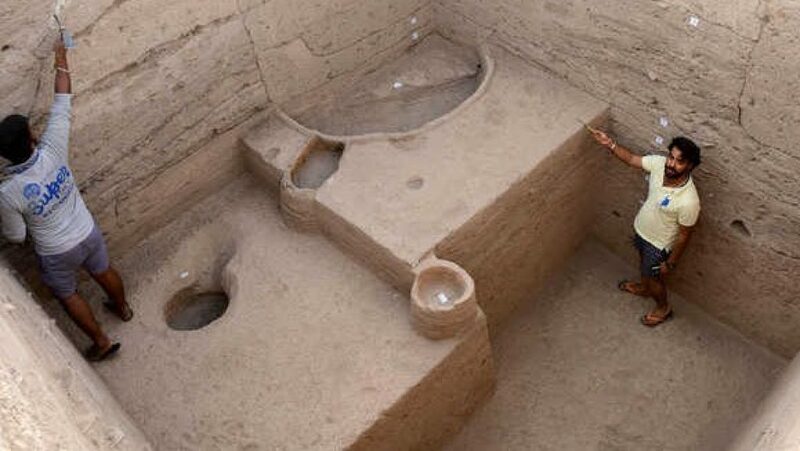 Archaeological excavations have revealed the remains of three successive phases of the early- Harappan culture, mature Harappan and Painted Grey Ware culture. This site was excavated by Shri J.S.Khatri and Shri M.Acharya of the Department of Archaeology & Museums, Government of Haryana. The earliest settlers dug up large pits over which wattle-and-daub huts were raised. They were familiar with agriculture and domestication of animals. Their ceramic assemblage shows a close resemblance with the early- Harappan pottery discovered from elsewhere. Antiquities include bone-tools, micro-blades of chalcedony, copper arrow-heads and fish-hooks. The second sub-phase is characterised by occurrence of moulded mud-bricks, a feature peculiar to the pre-Harappan at Kalibangan (Rajasthan) and Banawali (Haryana). These were used for lining the dwelling pits. The third and final phase is marked by the construction of rectangular and square houses. All the six pottery fabrics of Pre-Harappan (early-Harappan) found at Kalibanga were also noticed along with a few new fanciful designs and shapes. The most important discovery, however, is the recovery of eight steatites (seven square and one circular) two terracotta and two shell seals and one terracotta seal. These contain geometrical designs only. Pride of this place goes to the regalia items, consisting of two crowns, armlets, bangles and necklace of silver, six gold beads (or pendants) of a necklace and more than 12,000 micro-beads of semi-precious stones etc. Mature Harappan period is identified with occurrence of pottery in the upper layers. Last activity on the site was that of digging up of a moat by the people of the Pained Grey Ware culture around their inhabited area. Kunal is 225 km away from Indira Gandhi International Airport. Kunal is 35 km away from Railway Station Tohana. The nearest hotel to Kunal is in city Tohana which is near about 35 k.m. kilometres away.